In Kyiv, activists are resisting law enforcement officers who are trying to take out the leader of the Movement of New Forces Mikheil Saakashvili from the place of a rally near the Ukrainian House in Tryshvsvyatitelskaya Street. According to QHA correspondent, some people began to leave the scene, but the rest intend to make a corridor for Saakashvili. 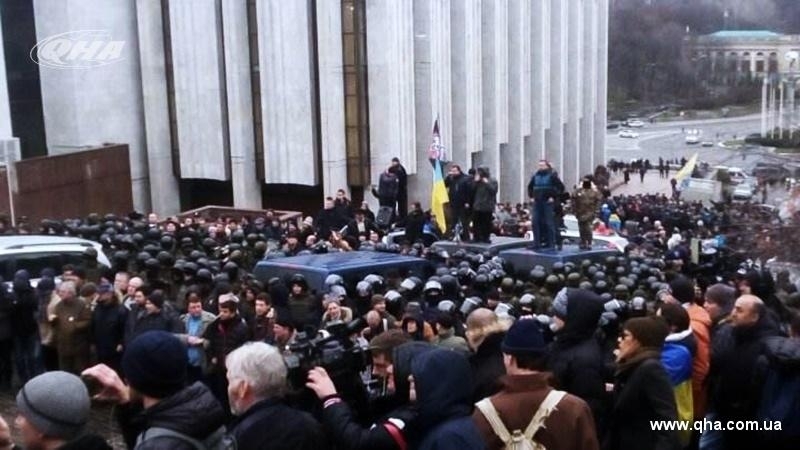 In connection with the events, they blocked the main street of the capital Khreshchatyk. Another battalion of law enforcement officers arrived to the place. QHA reported that on December 5, SBU officers, together with the General Prosecutor's Office informed Mikheil Saakashvili in the presence of a lawyer about the suspicion of committing a crime. At the moment, Saakashvili’s questioning is planned. Earlier, Saakashvili was detained on the roof of the house, where he climbed, escaping from employees of the SBU. From the roof of the building, he said that the current authorities intend to kidnap him. A spontaneous rally took place on the spot. Activists, supporters of the ex-president of Georgia blocked all the exits from the building and began to erect barricades. Previously, the Special Forces knocked out the door in Saakashvili's apartment and conducted a search.